The Langhe is a food lover’s paradise. It’s the home of the international Slow Food movement, the land of the white truffle, even Nutella comes from here, need I say more? There are Michelin-starred restaurants, if that’s your thing, more than anywhere else in Italy, but that’s not really what this area is about. The Langhe, to me at least, is all about honest, local, seasonal food, made from top quality, Piemontese ingredients. Absolutely everything is sourced locally, seasonal and homemade. Most places make their own bread and grissini (another Piemontese invention), the beef comes from just down the road and the cheese from just up the road. The rabbit was caught by their uncle, the truffles found by their brother. Fruit, nuts, vegetables…. everything is local and, wherever possible, in the family. To me at least, it’s exactly how food should be. 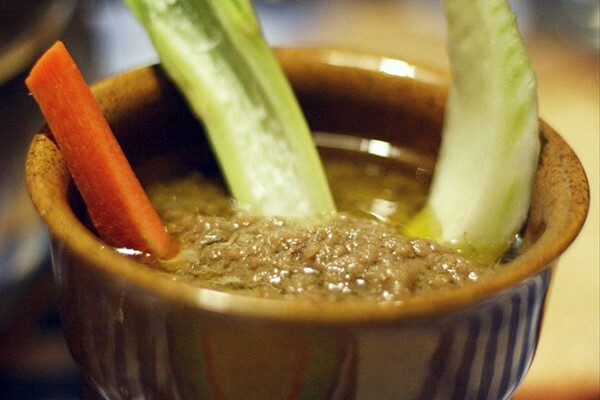 Carne Cruda is roughly chopped raw veal, marinaded in lemon juice, olive oil, salt and pepper. Think Steak Tartare, but far simpler and, in my opinion at least, far better. 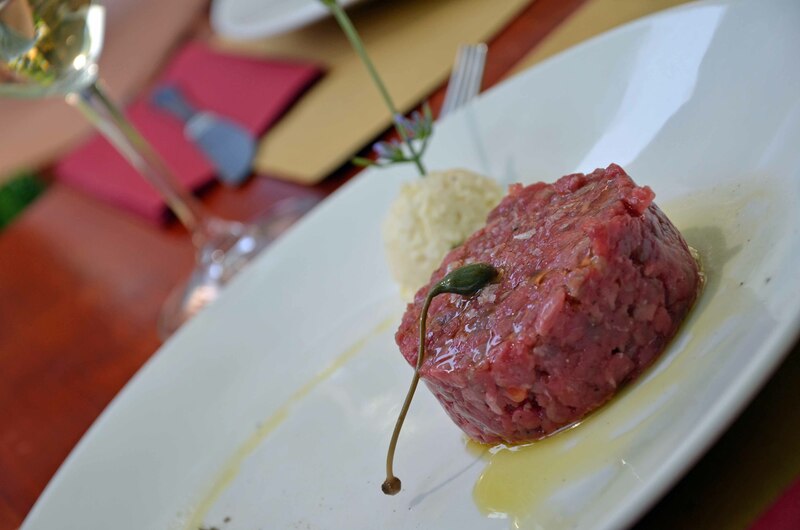 It is made from Fassone Piemontese, a local breed of cattle which is incredibly lean. In fact, it contains less fat than chicken and even many types of fish. 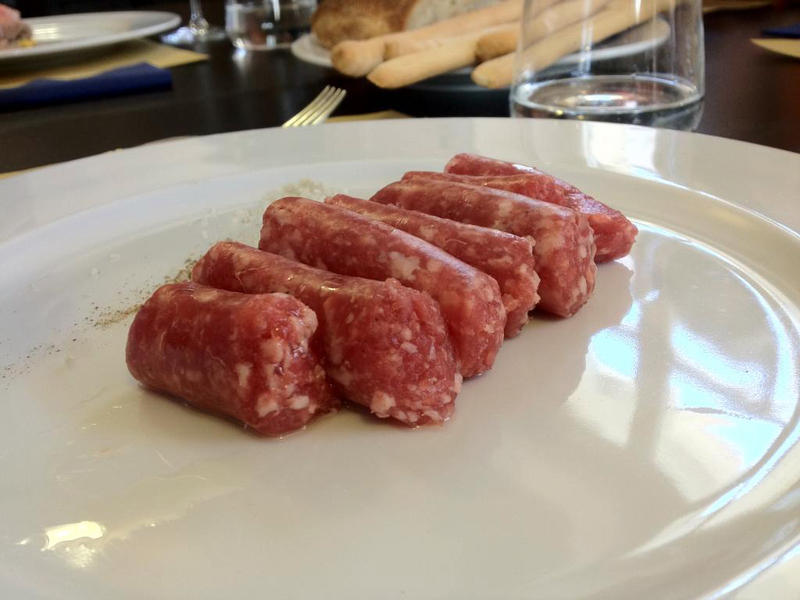 I was always told not to eat raw sausages, but Salsiccia di Bra is an exception to this otherwise very sensible rule, because it’s made of veal, from the same local Fassone cattle as Carne Cruda. Once you get your head around the fact that you are eating raw sausage, you’ll be blown away by how good it tastes! Vitello Tonato is another ever-present on Langhe menus. Very thinly sliced veal with a creamy tuna sauce, it is served cold and is perfect as a fresh, light, summery appetiser. Tajarin is a pasta, but it’s not just any old pasta; it’s made with up to 40 egg yolks per kilogram of pasta dough, which is a lot of egg. This gives it a remarkable golden yellow colour and an incredible, rich but delicate flavour. It is usually served with either a meat or mushroom ragu or butter and sage. If you’re lucky enough to be here in autumn, don’t miss the opportunity to get some white truffle (tartufo bianco) shaved on top. Another pasta dish, Agnolotti del Plin (Plin means ‘pinched’ in local dialect) are small parcels, like ravioli but smaller, usually filled with meat and served with butter and fresh sage. 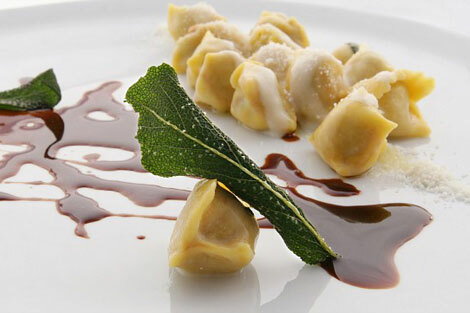 Fresh and delicate, they are unlike any ravioli you may have tried before. Again, get some white truffle on there if you can! Beef braised in Barolo. The term ‘hearty’ was invented for this dish. On a chilly, late autumn day, after a stroll through the vineyards, there can be nothing finer than a good glass of red wine and a Brasato al Barolo. There is a whole range of cheeses from these parts… Bra Duro and Tenero, Murazzano, Robiola, Toma, Castelmagno and Raschera to name a few. Get a cheese plate, or better still, visit a cheese producer as there is something here to suit every taste. I can’t talk about foods of the Langhe without mentioning the famous white truffles. Visit from October to December and prepare to be blown away. You can have it freshly shaved over pretty much anything, but a fried egg is a local favourite. 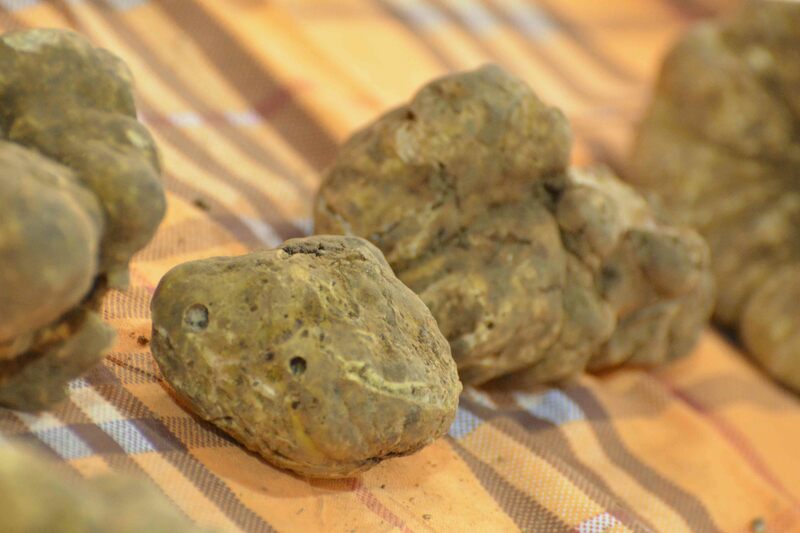 And if you want to take your own truffle home, head to the International White Truffle Fair in Alba and get haggling! Of course, this is just a small selection, there are so many more foods not to miss here in the Langhe, as well as a few that, in my opinion at least, could probably be skipped unless you’re feeling particularly adventurous… tripe, tongue or bollito (a selection of cuts of veal, including some rather interesting parts) anyone? One last thing, try to squeeze in a trip to Cherasco too. It has two great foodie claims to fame… snails and Baci di Cherasco. The snails come in every form imaginable and are, so I’m told (I’ve not summoned up the courage to try one yet) incredible. Baci, meanwhile, are small, hand-made chocolates with hazelnut in them. I’m salivating a little bit just writing about them. That’s enough talk about food though, it’s time to go eat! Only 4 courses?? My record so far is 9, but sometimes the food just keeps on coming! Cool, which has been your favourite so far? I reckon the best way to try a tartufo is either on a fried egg, or just get a bit on top of your pasta. It doesn’t cost too much then and it’s well worth it! You definitely have to try some white truffle then, you’ll love it! Well let me know when you’re next out this way and we’ll have to meet up for some raw sausage! Thanks for all the suggestions! I can’t wait to try at least one of them in a few weeks 🙂 I can already taste the flavors of the Langhe! 🙂 I’m only in Piemonte for a couple of days…how much food can I eat? Why, why, why have I not yet made it to Piemonte?!?!? How is it possible??? Your post has inspired me to get over there! Haha!! Just make sure you’re hungry though! May be good but it’s a vegan’s or vegetarian’s worst nightmare! ;) nice article guys! After this, I would prepare a proper full list of local food and restaurants that you have tried near home. Plus where to go for wine tasting (Neive like). Wow, the food there definitely looks better than the average restaurant offerings in Rome…although, I’m not sure I could eat raw sausage – I tried cold soup once and it was so wrong that I was unable to swallow it! We are heading over there in a couple of weeks because I heard that there’s a specialty where cherries are cooked in Timorasso? Can’t wait! Cool, I’ve not heard of that. Where do they do it? Nutella is from there? Well now I’m just wondering why that’s not your tag line. Living in the Langhe: where nutella comes from. Of course, I may not be reflecting the general readership on that point. Ha ha, you’re right, maybe it should be… You’re definitely reflecting my wife’s opinion, and that’s got to be important! Wonderful to find your blog (through Michelle Fabio’s Baby Espresso). My husband grew up in Alessandria and once when we were visiting his family we got as close to you as Asti. Very interesting area. Hopefully we will get back again soon, although traveling from Houston is expensive. Meanwhile, I’ll keep up on semi-local happenings by reading your blog! Best of luck on getting your permesso. And, I loved your description of that complicated number 5. Hi AmyEmilia, thanks for your message! You’ll have to take a trip a few miles further south on your next trip and check out the Alba area, so much to see… I can imagine travelling from Houston isn’t the easiest, but it’s worth it, right? 😉 Thanks for following!